The Yamaha SPX90 is an amalgam of advanced acoustical research and digital technology designed to provide musicians and home recording enthusiasts with a wide range of exciting effects. 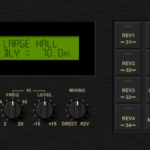 The Yamaha SPX90 Digital Multi-Effect Processor utilizes highly refined LSI (Large Scale Integration) technology to create natural reverberation. Not only is its assortment of 30 preset effects comprehensive enough to suit most studio and performance applications, the SPX90 also allows you to create up to 60 additional effects and store them for instant recall. The SPX90 can create effects far beyond mere reverberation, though that in itself is of a truly superior quality. A variety of echo, delay, and special effects – each with comprehensive parameter and adjustments – can be accessed at the touch of a switch. And as the Yamaha SPX90 is MIDI-compatible, it can be programmed to apply separate reverberation effects to a variety of MIDI compatible instruments. The SPX90 Digital Multi-Effect Processor will prove extremely useful in a variety of applications: acoustic electric, PA, MIDI instrument, and home recording systems.